KIEV, Ukraine -- Ukrainians voted on Sunday for a leader they hope will save their country from bankruptcy, dismemberment and civil war, but eastern cities were turned into ghost towns where armed separatist fighters kept polling stations shut. Ukrainian businessman, politician and presidential candidate Petro Poroshenko (C) speaks to journalists after casting his vote during a presidential election at a polling station in Kiev May 25, 2014. The election marks the culmination of a revolution that began in February when a pro-Russian president fled the country and spiraled into an existential crisis when Russian President Vladimir Putin responded by declaring Moscow's right to invade. The main candidates, including frontrunner Petro Poroshenko, a confectionery magnate, are promising closer ties with the West in defiance of Putin. "These are extremely important elections. We have to make sure Ukraine becomes a truly independent country, a powerful independent state that nobody will be able to push around," said pensioner Mihailo Belyk, 65, casting his ballot at a crowded polling station in a southeastern district of the capital Kiev. But in the Russian-speaking eastern provinces of Donetsk and Luhansk, where pro-Moscow fighters have proclaimed independent "people's republics", men with guns succeeded in blocking a vote that would imply their regions are still part of Ukraine. Nor was any vote held in Crimea, which Russia annexed in March. Ukrainian authorities said only about 20 percent of polling stations in the two restive eastern regions were working. Just 16 percent of the 3.3 million people in Donetsk region would have access to a place to vote. No polls were open in the regional capital, a city of a million, where streets were largely empty with people afraid to venture outdoors. Putin, who branded eastern Ukraine "New Russia" last month, has made more accommodating noises of late, saying on Saturday he would respect the Ukrainian people's will. He has announced the pullback of tens of thousands of troops massed on the frontier. But the absence of more than 15 percent of the electorate - both in the eastern regions and in Crimea - could give Moscow an excuse to raise doubts about the victor's legitimacy and continue applying pressure on Kiev. In Donetsk, scores of armed separatists gathered outside the sprawling and guarded residence of Rinat Akhmetov, Ukraine's richest man and owner of mines and factories across the Donbass coalfield, who has thrown his weight behind a united country. "We must guarantee the rights and security of people who live in the Donbass, who today are truly suffering from terrorists who want to turn the Donbass into Somalia," frontrunner Poroshenko said after voting in the capital. European election monitors have largely pulled out of the Donetsk region for their own safety, citing a campaign of "terror" by the pro-Russian separatists against Ukrainian electoral officials. Italy said an Italian journalist was killed on Saturday along with a Russian national near Slaviansk, the most heavily fortified rebel redoubt in the east, where the separatists have increasingly clashed with Ukrainian troops. Ukrainians hope the election of a permanent new president can finally open up a path out of a crisis that has put the very future of their country in jeopardy. Not only is territory slipping out of its control, but the country is nearly bankrupt, its economy looted by decades of leadership rated among the most corrupt in the world. It still depends on Moscow for natural gas. Since pro-Russian President Viktor Yanukovich fled in February after more than 100 people were killed in demonstrations, Moscow has refused to recognize the interim leaders in Kiev, describing them as a fascist junta who threaten the safety of millions of Russian speakers. Ukrainians hope that Moscow would not so quickly dismiss an elected leader with a solid mandate. The United States and European Union also view the election as a decisive event in ending their worst confrontation with Moscow since the Cold War. Their response to Russian interference in Ukraine so far has been limited to freezing the assets of a few dozen Russian individuals and small firms. But they have threatened to take far more serious measures, even targeting whole sectors of Russian industry, if Moscow interferes with the vote. At a school in a Donetsk suburb, pensioner Grigory Nikitayich, 72, was unhappy about being denied the right to vote for Poroshenko. "I don't even know where I can vote. No one has said anything. What kind of polls are these? Things are bad." Even Ukrainian soldiers sent to assert the government's authority in the east said they had no place to vote. "Our superiors promised we would be able to vote here but it turns out that is not so. This is a violation of my rights, it's ridiculous - I am here to safeguard an election in which I cannot vote," said Ivan Satsuk, a soldier from the Kiev region sent to man a roadblock near the eastern port of Mariupol. Voting ends at 8 p.m. (1300 ET), when exit polls will indicate a result ahead of an official outcome on Monday. Polls make Poroshenko, known as the "chocolate king" because of his confectionery empire, the runaway favorite among the 21 candidates, though it is not clear whether he can win the 50 percent needed to avert a runoff vote on June 15. Poroshenko served in the cabinet both under Yanukovich and under a previous government led by Yanukovich's foes, giving him a reputation as a pragmatist capable of bridging Ukraine's divide between supporters and opponents of Moscow. He nevertheless was a strong backer of the street protests that toppled Yanukovich, acceptable to many in the "Maidan" movement of pro-European protesters who have kept their tented camp in the capital to keep pressure on the new leaders. He has urged voters to give him a quick victory, warning that new unrest might derail a second round. His closest, if distant, rival is Yulia Tymoshenko, a former prime minister jailed under Yanukovich and released the day he fled. She remains a divisive figure to many, more closely linked than Poroshenko with the economic failures and graft that have blighted post-Soviet Ukraine. "It is time to hold a referendum on joining NATO to restore peace in Ukraine," said Tymoshenko after voting in her native city of Dnipropetrovsk in central Ukraine. Russia is fiercely opposed to Ukraine joining the Western military alliance. 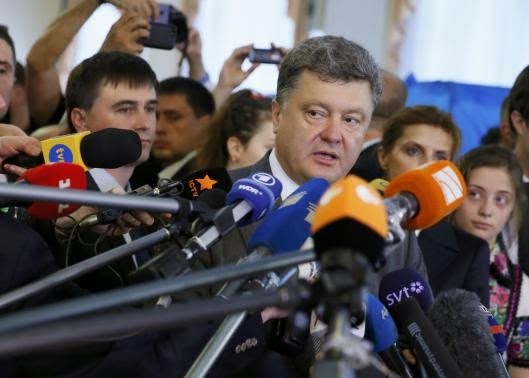 Poroshenko has said he would not join NATO. Interim Prime Minister Arseny Yatseniuk said a new president would move Ukraine away from a "grey zone of lawlessness and dark forces ... into a place where it is easier to breathe". "Efforts by the Russian Federation and the terrorists it finances to derail the elections are doomed to failure. We will have a legitimate head of state," Yatseniuk said on Sunday. Moscow denies financing or training the separatists, denials that Western countries dismiss as absurd. Putin pledged on Saturday to "respect" the people's choice and work with Ukraine's new administration - a conciliatory move during an economic forum at which he had acknowledged that U.S. and EU sanctions over Ukraine were hurting the Russian economy. He played down talk of a return to Cold War with the West and dismissed the idea he was bent on restoring the former USSR, whose collapse he has in the past lamented. Washington and its EU allies are concerned that while Russia may accept the election result, it may use influence in eastern Ukraine to undermine the new president's authority and keep the country beholden to Moscow. Russian officials have questioned the value of holding the vote when the east is in "civil war".